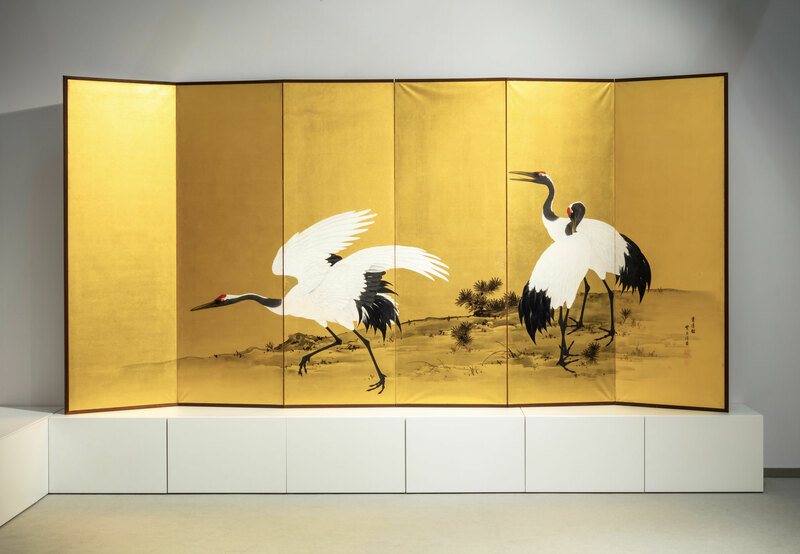 A striking pair of Meiji period six-panel folding screens by Mochizuki Gyokkei 望月玉渓 (1874-1939) showing a flock of cranes. 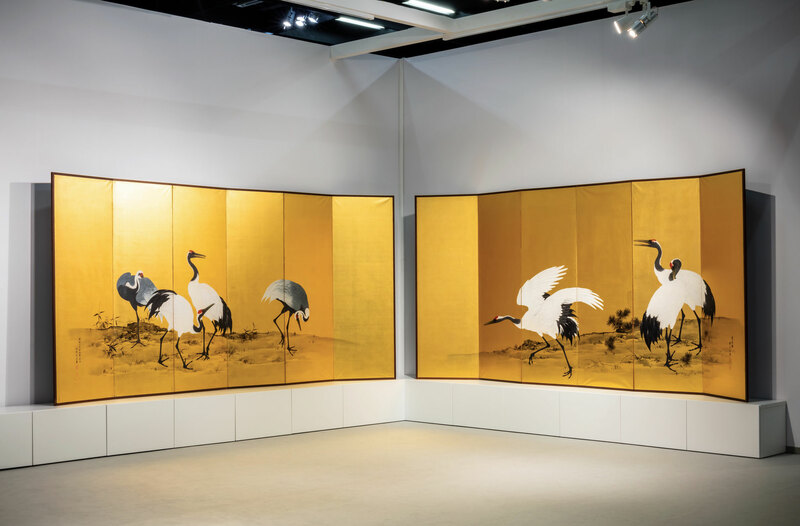 Together the two screens disclose a gorgeous seven-meter wide composition of interacting individuals, painted in ink and mineral colors on a glittering gold background. 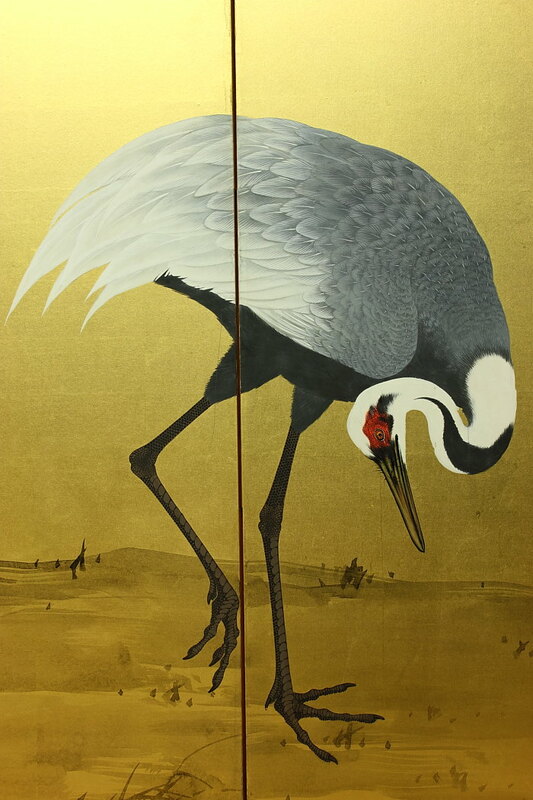 It is a rare large-size example of Gyokkei's excellent skills in rendering cranes, which can also be seen at the famous Heian shrine in Kyôto, where he created the interior design for the garden's pavillon Shōbi-kan 尚美館 with the paintings of many cranes. This building was moved from the imperial palace to the shrine's grounds in Taishō 2 (1912) and Gyokkkei was commissioned to recreate the wall design. 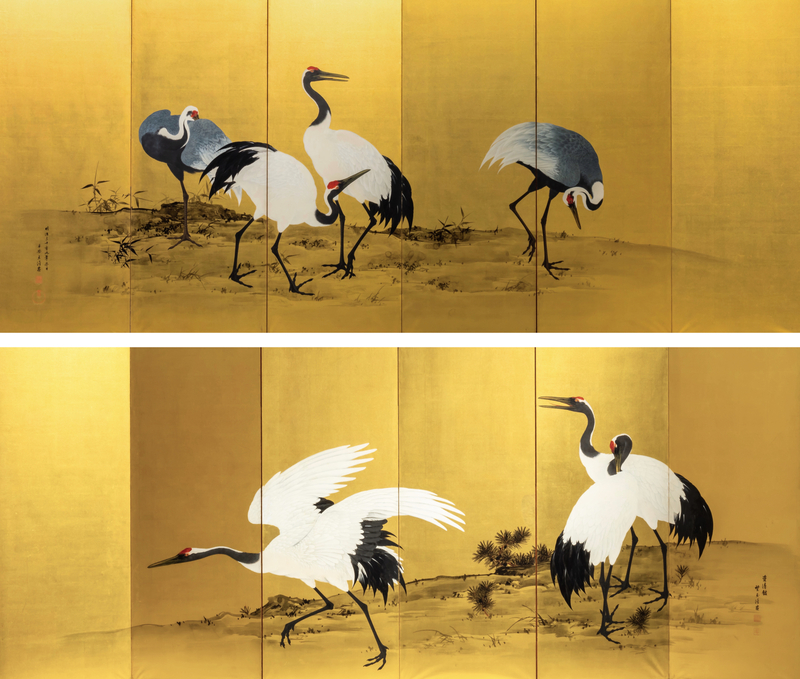 However, compared to these paintings, the artist’s signature on the left screen mentions a completion of the work on a winter’s day in Meiji 39 (1906). 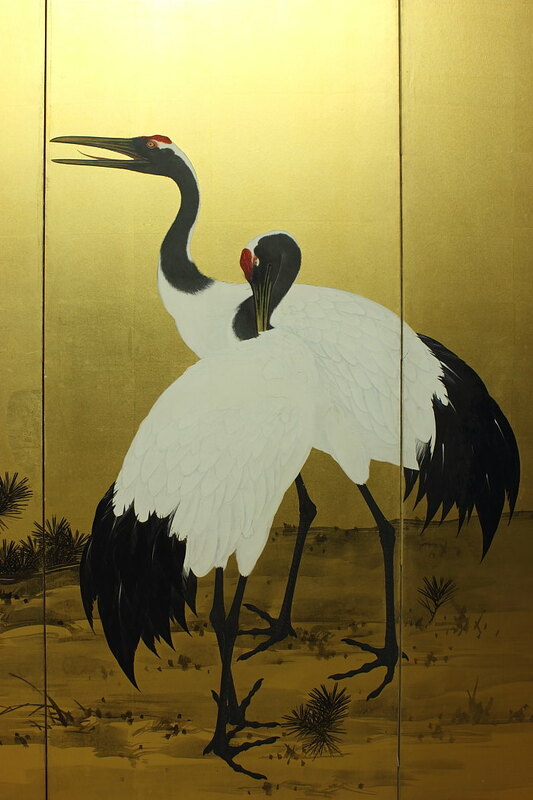 So the screen painting appear to be six years older than the door panel and sliding door paintings at the Heian shrine. 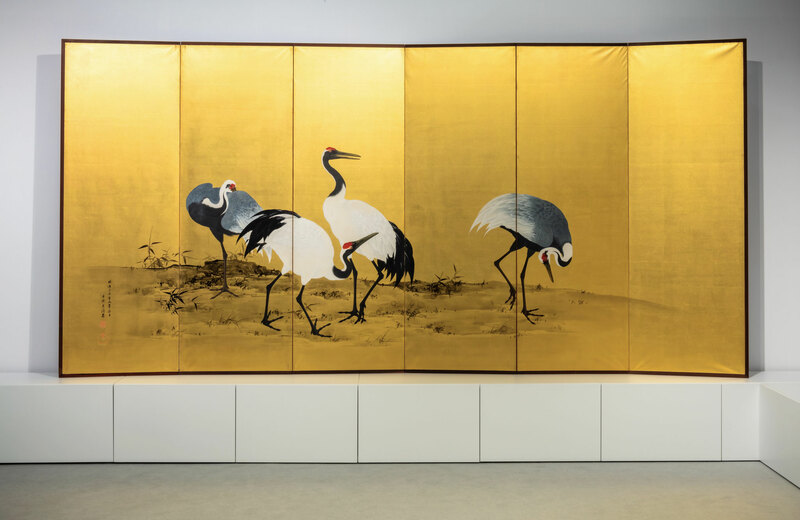 Interesting is, that Gyokkei used in fact some of the cranes from the screens as model for his wall paintings, which show for example a crane that seems to be a direct copy of the right screen's running crane with spread wings. Unfortunetly the Shōbi-kan building and its impressive layout by Gyokkei is only occasionally open to the public. 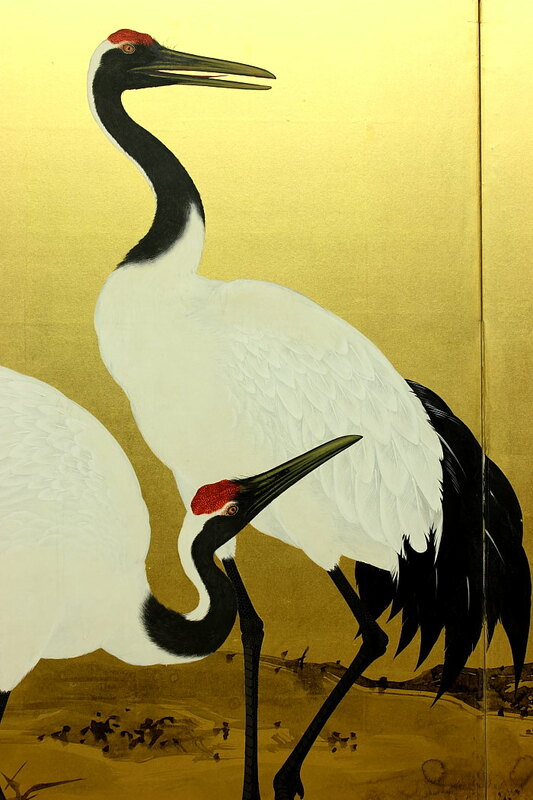 Another magnificant more public work by Gyokkei, not with cranes but with peafowls, can be seen in the Metropolitan Museum of Art. 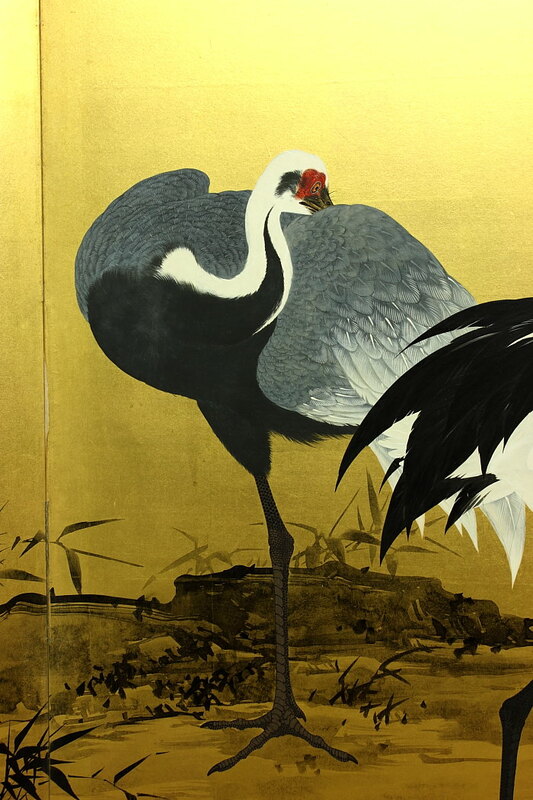 In his works one can detect more than two centuries of predecessors in bird-and-flower painting like the Chinese-style works by the Nagasaki school founder Shen Nanpin (ca. 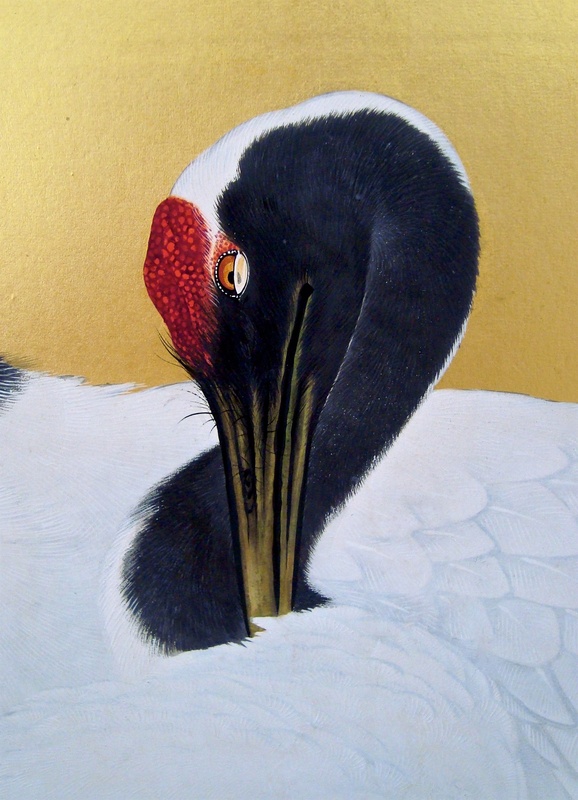 1682-1780) and the naturalistic approach of Maruyama Ōkyo (1733-1795) and his lineage. 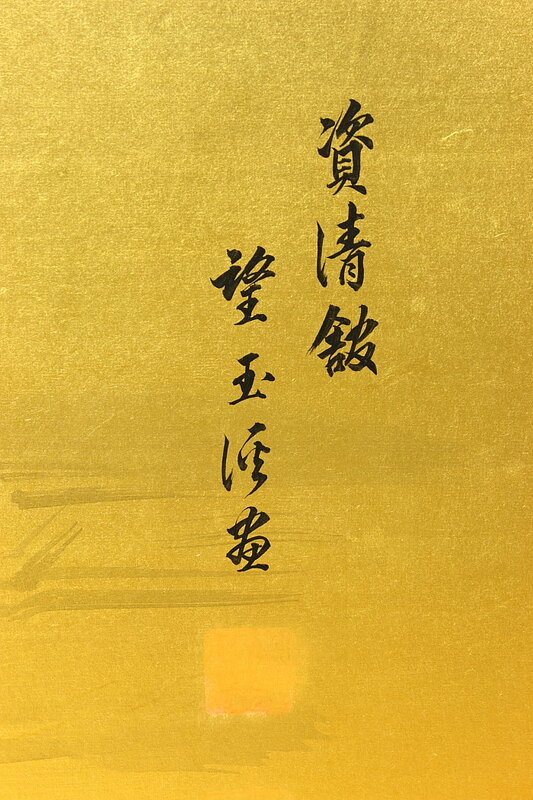 Mochizuki Gyokkei was the successor of his father Mochizuki Gyokusen 望月玉泉 (1834-1913), who has been working for the imperial palace as well. 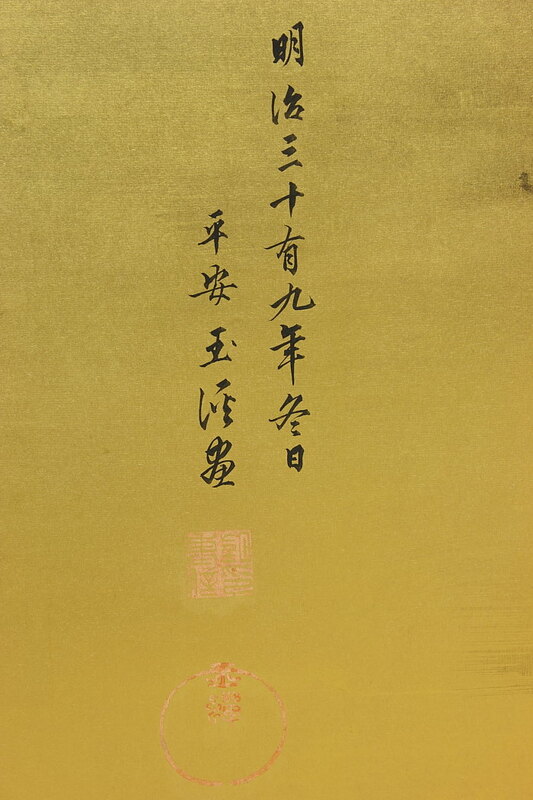 From him, Gyokkei inhereted his accurate brushwork through his training in the fifth-genration familiy style tracing back to his great-grandfather Mochizuki Gyokusen (1692–1755), who established the familiy studio combining these elements of Chinese painting of the Kishi school with influences by Shen Nanping and Japanese paintings by the Maruyama-Shijō school as well as western painting techniques.